BRUSSELS, Belgium -- In a strong defense of his rapprochement with Moscow, Ukraine’s president, Viktor F. Yanukovich, said Monday that his policy had bolstered Europe’s security, improved all-round cooperation with Russia and consigned to history the recent disruption of gas supplies to Europe. 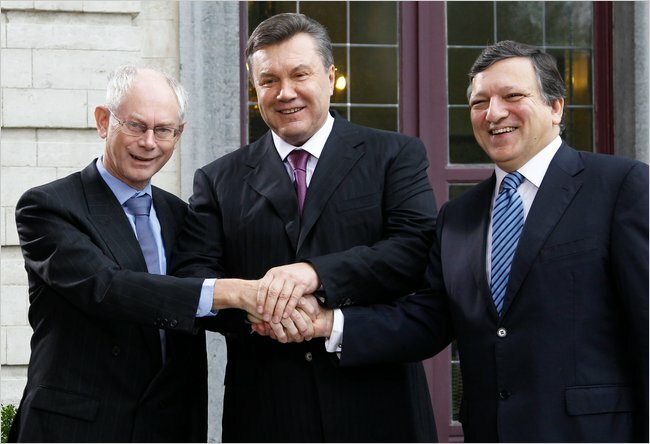 President Viktor Yanukovich of Ukraine (C), was welcomed by European Commission President Jose Manuel Barroso (R), and European Council President Herman Van Rompuy in Brussels. Mr. Yanukovich’s visit to Brussels came nine months after he came to power and began a hasty reconciliation with Moscow, striking a deal over gas transit and extending the lease of Russia’s Black Sea naval base. At the time, there were worries that the change of Ukrainian leadership would drag the country away from the European Union, and since the election the bloc has expressed worries about worsening human rights in Ukraine. But at the meeting Monday in Brussels, the European Union sought to encourage reform in Ukraine, saying it hoped to complete by mid-2011 talks on a free trade deal and other ties with the country. It also offered a plan toward visa liberalization — a move that would let Ukrainians travel more freely within the E.U. and would be a significant prize for the government in Kiev — though no clear timetable on requirements might be relaxed. Ukraine, which has been independent since the collapse of the Soviet Union almost two decades ago, borders four E.U. countries and is a vital energy corridor. But, having admitted 12 new nations to the E.U. since 2004, the bloc is careful not to give promises of membership to Ukraine, a country of 46 million people that was struggling economically even before the financial crisis drove it into the arms of the International Monetary Fund. While Ukraine has been improving its ties with Moscow, European nations have also seen better relations with Russia this year. The most notable development has been a significant rapprochement between Russia and Poland. In a sign of greater cooperation, a separate meeting also took place Monday between the Russian and Ukrainian energy ministers and the European commissioner for energy. The Russian energy minister, Sergei I. Shmatko, told reporters that transit of Russian gas through Ukraine could be relied on and that the interruptions seen in the winters of 2005-2006 and 2008-2009 would not be repeated. Asked about energy cooperation, Mr. Yanukovich criticized the proposed Southstream pipeline project, which would transport Russian natural gas to the Black Sea, Bulgaria and then to western Europe, bypassing Ukraine. Mr. Yanukovich defended the idea of closer cooperation with Gazprom, the huge Russian energy company, over the modernization of Ukraine’s pipeline network, rejecting suggestions that Ukraine’s Naftagas could be swallowed by Gazprom. Concerns about rights within Ukraine also came up during the meeting. At a press conference in Brussels on Monday, both the president of the European Commission, José Manuel Barroso, and the president of the European Council, Herman Van Rompuy, highlighted concerns over human rights and freedom of the media in Ukraine. “People can talk freely in the way they were able to talk before,” said the Ukrainian president. “When the opposition claims that some freedoms are shrinking, my answer is always quite simple: I tell them, ‘Why don’t you provide us with an example of what has changed in 2010?”’ However, he promised to improve the law in place before a recent regional election over which the E.U. raised concerns. Referring to protests in Ukraine on Monday against a new tax code, Mr. Yanukovich said that the new rules were meant to address a shadow economy that accounted to 40 to 50 percent of the total. “We now have a whole generation of officials and bureaucrats who have created their business on the basis of corruption,” he said. Finally, asked how long it would take for Ukraine to become a member of the E.U., Mr. Yanukovich said Ukraine was still unclear how long the road to membership would be. “The main thing is to proceed along that road,” he said.